What should be Newton’s transportation priorities? Back in 2014 Mexico City’s mayor announced a new mobility law that dramatically revamped its transportation priorities and, in turn, future policies. The law — illustrated by the diagram here — established a mobility hierarchy that shaped the city’s priorities for road use planning and budget allocation. Pedestrians were at the very top of the pyramid, followed by bikes, public transit users and providers of transport. Private cars — you’ll notice — are at the bottom of the hierarchy. Now Mexico City is the world’s fourth most populous city, and nothing really like Newton. 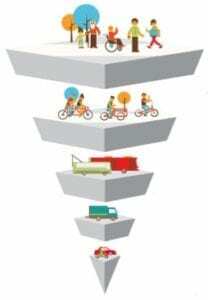 But if you were to create your own transportation pyramid, placing the mode Newton should prioritize the most on top with each subsequent item below, which order would you choose and why? Btw, what is Newtons policy on allowing autonomous cars to do trials here? We are an ideal location. Btw Bugek: Instead of taking this thread off topic before it even begins, care to answer the question? Improving mass transit should be the top priority. Newton has an ideal location to have far better and more interconnected public transportation and we should be thinking big and thinking long term to make that happen. After that, I think we need to be thinking about all of the above as ways to bridge the last mile problem. We must also recognize that a large portion of the population will continue to rely on cars unless and until they can be convinced that public transportation works well enough and is convenient enough to leave the car at home. It’s a big challenge but we shouldn’t shy away from it. The greatest need and most expensive to fix is public transit, and it’s the only way to get large numbers of cars off the road. I love the idea of D, but it just doesn’t seem to work out as planned. I really don’t know what prioritizing pedestrians would look like in a city as large in area as Newton. Are we talking village centers? Schools? What about the areas far from village centers, with a more rural feel (no sidewalks)? Village centers: A => B > C > E = D – Pedestrians have priority closely followed by bikes, mass transit, cars and ride shares. Outside of village centers: C > E => B > D > A – Mass transit has priority followed by cars, bikes (closely), ride shares, pedestrians. Something like A > B > C > D > E could work for Boston or Cambridge as they have the density, transit options and jobs to make it so you can live and work in the city without needing a car. We don’t really have that in Newton outside of the village centers. Overall mass transit is probably going to be the best option followed by more of a focus on pedestrians/bikes in the village centers and cars/bikes outside. How about fixing / repaving some of the streets? That helps cars and bikes. The streets are pathetic. Or put in real speed bumps, because that’s what the potholes are now. It might be worth studying whether to put a light on walnut street in Newtonville. It’s very chaotic with 2 pedestrian crosswalks and cars stopping/ not stopping. When Austin Street has residents it’s going to be even crazier. Bugek – MBTA is improving mass transit in communities that are making improvements for mass transit, like Everett’s bus lane and priority signals. Also, where developers are chipping in for improvements, like Wynn, New Balance, and XMBLY. MBTA’s bus service is about to start its phase 2 planning stage – where to invest for improvements. (Phase 1 was cost-neutral improvements). And, some communities, like Lexington and Dedham, run their own shuttle services. Newton, especially along bus route 59, has the density and commercial development to support frequent, reliable bus service that runs into the night. Mass transit first, by a longshot. After that I have a hard time prioritizing, because we need a system that achieves a harmonious relationship among pedestrians, cyclists and cars. Making the city safer for pedestrians and cyclists doesn’t have to be at the expense of smooth and safe auto traffic flow. In our village centers, however, I would prioritize pedestrians. MBTA buses don’t require new infrastructure, though a few more shelters and benches would be nice! “Our congested commutes are the result of decisions that stretch back decades.” A new approach to America’s traffic problem: measurements that prioritize the accessibility, sustainability, and livability of communities. Lucia, good point on the buses portion of mass transit not requiring new infrastructure, albeit the increase in frequency and locations served by buses to foster meaningful increase in ridership would entail considerable increase expenditure (many new and better buses, their maintenance and replacement, as well as road accommodations in many places). But, having said that, if your Brookings Institute article means concentrating on new ways of constructing and using places (to and from which we would otherwise need more travel), that certainly makes sense. Ironically (or maybe not), however, that seems to bolster support for the tiny car concept in lieu of serious investing in mass transit, its infrastructure and accommodation — where, as Brookings suggests, building or focusing on great places would alter existing traffic patterns and intensity which mass transit would be designed to serve. I would put pedestrians and mass transit alongside one another. Nobody is going to walk to the bus or T station if they can’t do it safely. After that I’d say B, D, and E.
None of the above and all of the above. Each option has its own set of benefit and downside depending on specific circumstances. Nice weekend days: walking, running and biking is best. Unfortunately not everything black or white. Matt is right. The best we can do is to walk, bike or take public transportation whenever it is feasible to do so. Quite often it is not. We cannot ask work related commuters to take public transportation which may take an hour and a half to get from home to work when the car will do the trick in less than half an hour. The order of transportation related priorities like those listed by Greg from Mexico City have led off every long range transportation plan I’ve ever worked on. Quite often, they are little more than wish lists from a plethora of various interest groups and local governments before the actual planning process takes place. The planning process should then bring a strong dose of reality in terms of costs, cost effectiveness, feasibility, public demand and public acceptance, but this is only one part of getting it right. The real test is what really happens in the real world as the years progress. The biggest gap I saw was a tendency to greatly underestimate the growth of regional suburban and exurban development, regional motor vehicle travel and regional vehicle miles traveled, (VMT). Most studies I’ve looked at predict that regional VMT will continue to grow rapidly during the next 20 years unless we get hit with a major, major economic downturn. Accommodating and regulating this growth is going to be the real challenge for Newton and just about every other municipality in most parts of the country. I think we can reverse most of these adverse trends, but such changes won”t come easily or quickly. I hope I’m proven wrong on all of this, but I’m not holding my breath. I would like the city to focus on the “last mile” around T and bus stops, schools and village centers. I would envision a network of lanes on low-traffic side roads for bikes, scooters and very frequent autonomous vehicle shuttles, as Bugek suggested above. These should not be on current main roads where it is not safe or feasible. I drive my kids to the T stop daily and often drive to village centers to save time, even though they are less than a mile from my house. I would never bike on main roads or allow my kids to do so (even with a bike path) for safety reasons, but would gladly do so if there was a functioning network of paths on side roads. Developing a safe bike path system for commuters (on side roads as much as possible) would also be a priority, as well as dedicated bus lanes for commuters. These goals are more difficult since there are multiple towns and existing infrastructure that has to be managed, so I would focus on the “last mile” shuttle/bike lanes that are totally in Newton’s control. It we can get more people to take advantage of public transit options that exist, we will have more leverage to demand more service from the MBTA. As a software engineer who does some work with AI ( so called deep learning) ( I do medical and scientific software engineering) , robotic and image guided surgery, computer vision, and other class 3 FDA regulated software ( highest risk) I feel it is my duty to inform you that autonomous driving ( as you likely envision it ) is at best mis leading and at worst a complete scam. In my opinion, which is better educated than most, that autonomous driving will never exist. But how can all the investors be wrong you would ask. And I can only respond by asking you to watch the recent documentary on Theranos. Or even consider the latest fiasco around the Boeing situation. So, let me repeat this. Autonomous cars will never exist without a closed off road system. You’re welcomed. According to the Federal Gov, Dept of Transportation, vehicle miles traveled per capita (VMT), has been declining. @Lucia. You are absolutely correct. I was doing something a good analyst should never do. I took predictions made in 2008 for 10 year VMT growth nationally and didn’t check the updates. Be that as it may, we still have the challenge of helping folks get to work who have no other viable option but to drive by car. I agree that Mass Transit and Pedestrian safety/ experience go together. You need to make sure that people can move from their homes TO mass transit. That movement should involve feet. It can also involve bikes, scooters and other personal transportation options outside of an automobile, because of safety concerns, carbon emissions, and the aforementioned pedestrian safety. All that said, we have already prioritized for cars and have built that way for 70 years, so even if we change priorities now, changes in infrastructure are likely to take a generation or two to prove results.